Sixteen-year-old Bri wants to be one of the greatest rappers of all time. Or at least win her first battle. As the daughter of an underground hip-hop legend who died right before he hit big, Bri's got massive shoes to fill. But it's hard to get your come up when you're labeled a hoodlum at school and your fridge at home is empty after your mom loses her job. So Bri pours her anger and frustration into her first song, which goes viral . . . for all the wrong reasons. Insightful, unflinching, and full of heart, On the Come Up is an ode to hip-hop from one of the most influential literary voices of a generation. It is the story of fighting for your dreams, even as the odds are stacked against you, and about how, especially for young black people, freedom of speech isn't always free. Bri is an aspiring rapper. Her father was also a rapper, a rapper who died way too young. She lives in a tough world--our world--and poverty and racism are forces that confront her every day. Drugs and gun violence have already taken their toll on her family, and the risk of them doing more harm is always there. Yet Bri still dreams and works toward her dream--in an imperfect, human way. This is extra hard when people make unfair assumptions about her because of the color of her skin and where she's from. Thomas is an incredibly skilled writer with an amazing voice, and her characters are outstanding. She writes powerfully about racism, modern culture, family, friendships, hardships, and--ultimately--hope. That last bit, hope, is important to me as a reader and a writer, especially in books for children and teens. I recommend this thought-provoking, moving book. 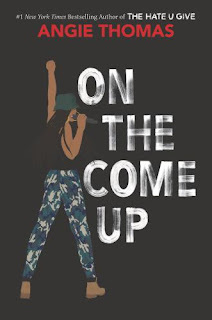 Have you read On the Come Up? Running. That's all that Ghost (real name Castle Crenshaw) has ever known. But never for a track team. Nope, his game has always been ball. But when Ghost impulsively challenges an elite sprinter to a race--and wins--the Olympic medalist track coach sees he has something: crazy natural talent. Thing is, Ghost has something else: a lot of anger, and a past that he tries to outrun. Can Ghost harness his raw talent for speed and meld with the team, or will his past finally catch up with him? Ghost's dad is in jail for a terrible something (no spoilers here!) that happened three years ago. Ghost was in fourth grade at the time, and it still haunts him. His mother works long hours so she can improve their lives, but this leaves Ghost bored and with time on his hands. 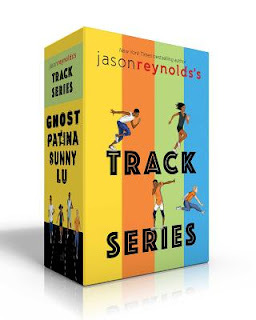 When he comes across a track team practicing at the park, an opportunity for something entirely new to Ghost arises--but it comes with a whole new set of challenges. 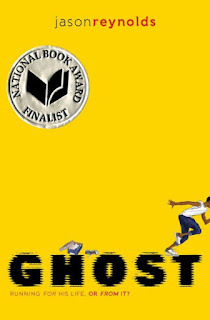 There is so much to appreciate in Ghost, the first book in Jason Reynolds's Track Series. The layers of scars Ghost has from the night his father was arrested, the details of living with less money--it all feels real. Ghost is an endearing, wonderfully-flawed character. I love the voice and the relationships in this book, and I especially love the hope in it. Your turn! Have you read any of Jason Reynolds's Track Series? What are you reading now? There's a new baby at our house. We were going to wait to get another dog because Thistle... We miss him so much. He was so very special, and he can never be replaced. The thing is, the kids grew up, and the house got quiet. A few weeks ago, we saw a small greyhound who looked a lot like a whippet, and Jim and I got to talking about when we might be ready. 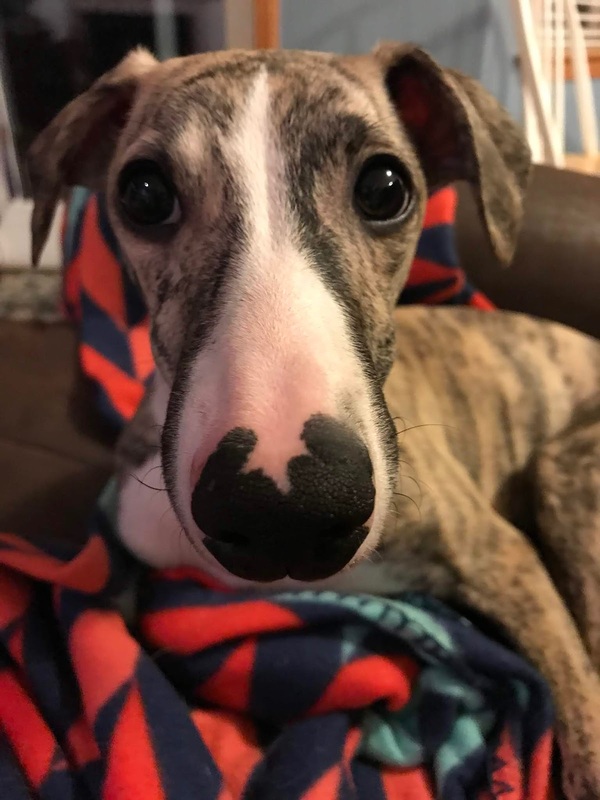 The next day, I went to Starbucks and met a whippet puppy who melted my heart. Then I found out she had brothers. Long story, but we adopted a 4 1/2-month-old puppy. He came pre-named. His name? Simon. We thought about changing it, but how could we? He already knows his name. Besides, Simon is a family name, and Simon is now family. I think Thistle would be okay with that, too. 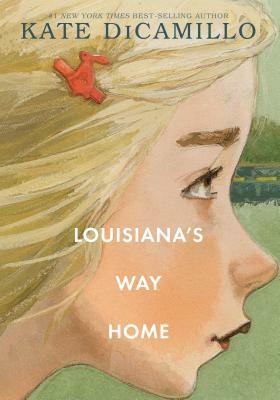 I just read Louisiana's Way Home, and it was sooo good! But of course it was, right? 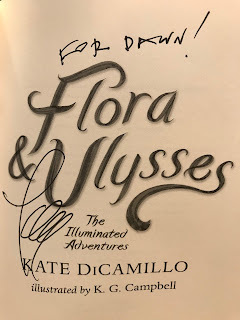 Kate DiCamillo is such an amazing writer, I think she might be magical. When Louisiana Elefante's granny wakes her up in the middle of the night to tell her that the day of reckoning has arrived and they have to leave home immediately, Louisiana figures that it is only a matter of time before Granny changes her mind and they come back home. After all, Granny has many middle-of-the-night ideas. But this time, things are different. This time, Granny intends for them never to return. Called "one of DiCamillo's most singular and arresting creations" by the New York Times Book Review, the heartbreakingly irresistible Louisiana Elefante was introduced to readers in Raymie Nightingale, and now, with humor and tenderness, Kate DiCamillo returns to tell her story. One of my favorite things about any Kate DiCamillo book is the voice. This holds true for Louisiana's Way Home as well. I read the book in a few sittings, and I couldn't help but feel the rhythm of the voice in my head each time I closed the book. Louisiana is a smart girl with seriously difficult things going on in her life. Her courage and bright outlook make her a truly engaging character, and her heart, her vulnerability, and her thoughtfulness make her extremely lovable. The story takes place in the 1970s. As wonderful as cell phones and the Internet are, I think their existence can be problematic in some stories, and I wonder if that played into DiCamillo's decision when she chose the year her story would take place. The story is funny and clever, and it has so many fun details. I think it would make a fabulous read-aloud book. I loved reading it, and I highly recommend it! I've read many of DiCamillo's books. While I intended to read Raymie Nightingale when it came out, I never got to it. You know how our TBR lists grow and grow and grow--there are so many great books to read! Yay! Anyway, I'll definitely be reading Raymie Nightingale in the near future! I'm sure that moment was much more memorable for me than it was for Ms. DiCamillo, but that's okay. The important thing is that I managed to avoid any embarrassing fangirl behaviors, like tripping, being unable to talk, or being unable to stop talking. (Sorry, E. Lockhart. *) Also, I got her autograph! *All I did was greet E. Lockhart with A LOT of enthusiasm, and she was very gracious about it--which makes me like her even more. "DiCamillo builds a resilient and sympathetic character in Louisiana, and the juxtaposition of her down-to-earth observations with Granny's capriciousness tightens the narrative and allows for a good deal of humor... The overarching themes addressing forgiveness, love, friendship, acceptance, home, and family ("Perhaps what matters when all is said and done is not who puts us down but who picks us up") ring honest and true." "DiCamillo is able to address complex topics in an accessible and ultimately hopeful way. There is never sadness without comfort, fear without consolation. Louisiana's soul-searching is no exception and further solidifies DiCamillo's reputation as a skilled storyteller who trusts her readers to wrestle with hard things. A thoughtful and finely written story that earns its place among DiCamillo's other beloved books." How about you? Have you read Louisiana's Way Home? What author or authors would you love to meet? Also, what are you reading? Tell me, tell me! I'm sitting beside Thistle as I write, something I've done regularly for the past twelve years. But this time is different. Thistle is fourteen, and we're soon going to have to say good-bye to him. I'm writing through tears, but I'd rather do it now, when he's with me, toasty-warm and with his side rising and falling beneath the blanket. He's in his favorite place, at home on the couch, and he's lying on the *best* couch cushion. I feel like I need to write about him and to let the world know he was here. The kids were twelve and nine when Thistle joined the family. He was reunited with his littermate Pepper, our other sweet dog, at the time. He fit in immediately. My son and I brought him home, and we took him around the house, showing him all the places he could go. We both remember he seemed to smile when we encouraged him to jump onto a bed. eating chicken and hot dogs, curling up with someone on his couch, having his ears rubbed, and lying beside me while I write. Good boy, Thistle. You'll be in my heart forever. Thank you for all you've given us and for making the world a sweeter place. I love you, and I'll miss you so. I wrote that yesterday. Thistle has now moved on, and it hurts so much. I hope he's somewhere where he can run in the sun with his sister. I signed with the incredible Jennie Kendrick at Red Fox Literary!! I'm over-the-moon excited to get to work with Jennie, Karen Grencik, and the rest of the Red Fox team! Thank you, Jennie, for believing in me and my writing! Words matter. Art matters. Books for young people matter, and it's important for all kids to see themselves represented--and respectfully--in these books. Inclusion matters. It's empowering. 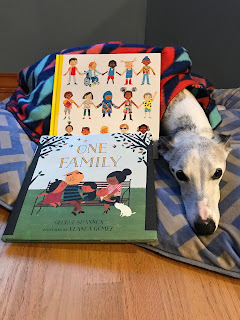 I want to share two fabulous picture books that emphasize inclusion. 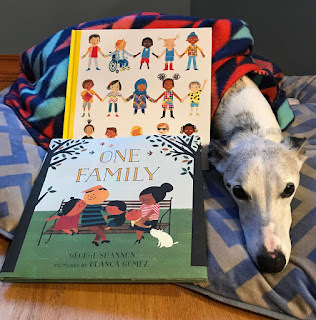 The first, ONE FAMILY, is a book I posted about back in 2015. I still love it. I've given it to young family members and friends, and I've recommended it to friends (and random people at our local indie bookstore who maybe weren't looking for a recommendation but ended up buying it, so yay!). 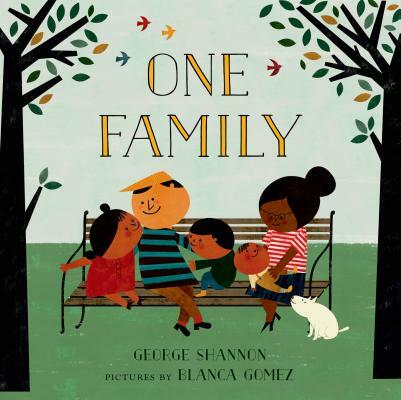 A playful counting book also acts as a celebration of family and human diversity. Shannon's text is delivered in spare, rhythmic, lilting verse that begins with one and counts up to 10 as it presents different groupings of things and people in individual families, always emphasizing the unitary nature of each combination. "One is six. One line of laundry. One butterfly's legs. One family." Gomez's richly colored pictures clarify and expand on all that the text lists: For "six," a picture showing six members of a multigenerational family of color includes a line of laundry with six items hanging from it outside their windows, as well as the painting of a six-legged butterfly that a child in the family is creating. While text never directs the art to depict diverse individuals and family constellations, Gomez does just this in her illustrations. Interracial families are included, as are depictions of men with their arms around each other, and a Sikh man wearing a turban. This inclusive spirit supports the text's culminating assertion that "One is one and everyone. One earth. One world. One family." 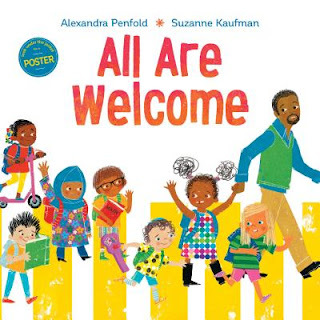 The second book I want to spread the word about is ALL ARE WELCOME. I've been sharing ALL ARE WELCOME with kids and teachers, and I'm so happy the book exists. The book jacket has an adorable poster on the inside. My copy is hanging in a classroom this very minute! I love it! 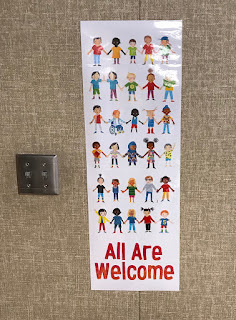 Look at that adorable, diverse group of children, all holding hands! Suzanne Kauffman's art is spectacular! 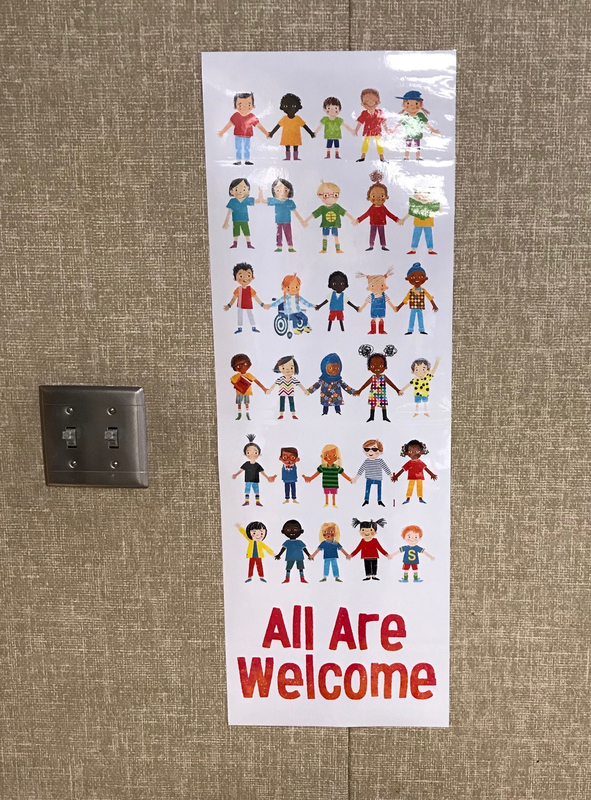 Follow a group of children through a day in their school, where everyone is welcomed with open arms. A school where kids in patkas, hijabs, and yarmulkes play side-by-side with friends in baseball caps. A school where students grow and learn from each other's traditions and the whole community gathers to celebrate Lunar New Year. ALL ARE WELCOME is a New York Times bestseller, and it also earned a starred review from Kirkus. In this photo of Thistle curling up with both books, you can see the beautiful cover that's underneath the jacket (that doubles as a poster) of ALL ARE WELCOME. 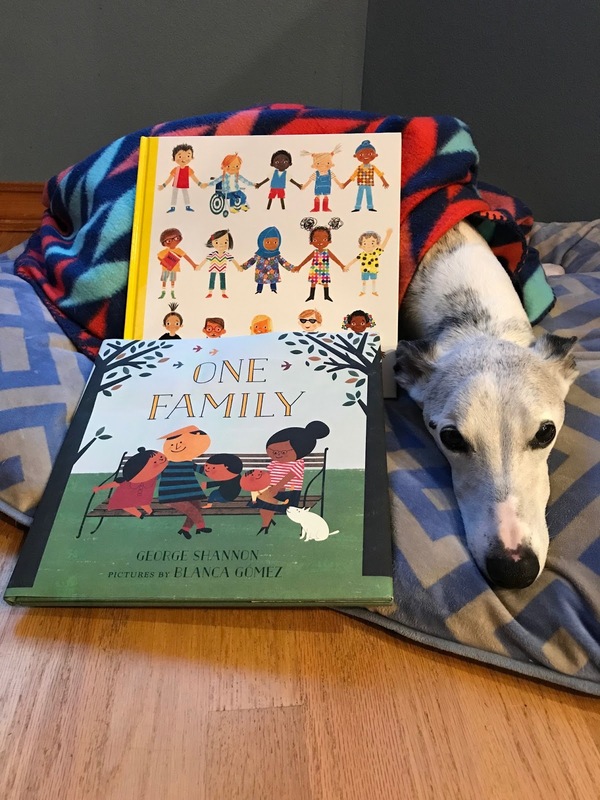 Have you read ONE FAMILY and/or ALL ARE WELCOME? Can you recommend any other picture books that emphasize inclusion?